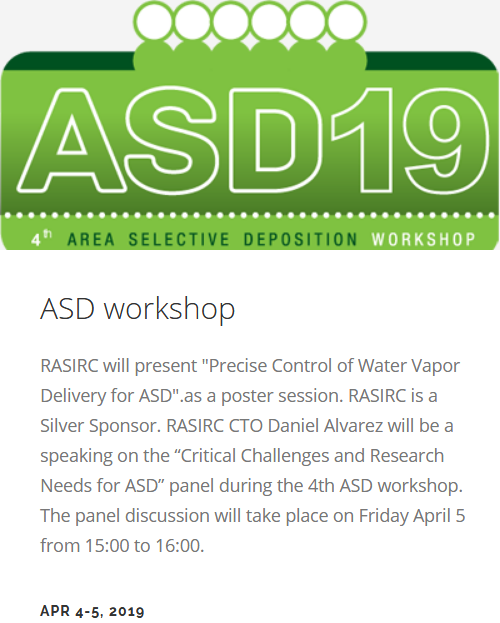 San Diego, Calif – March 29, 2019 – RASIRC will discuss test results for precise delivery of water vapor at the Area Selective Deposition (ASD) 2019 Workshop on April 4-5 in Leuven, Belgium. The company, a Silver Sponsor of the workshop, will review droplet and particle measurements as well as mass delivery under a variety of conditions. 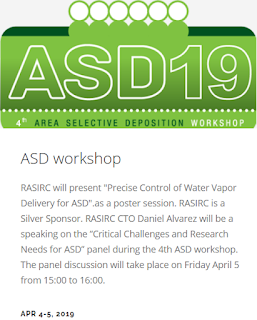 The RASIRC poster entitled “Precise Control of Water Vapor Delivery for ASD” will be displayed on Thursday April 4 and Friday April 5 as part of the workshop’s poster session. Additionally, RASIRC CTO Daniel Alvarez will be a speaking on the “Critical Challenges and Research Needs for ASD” panel during the 4th ASD workshop. The panel discussion will take place on Friday April 5 from 15:00 to 16:00. ASD Workshop is an annual event sponsored by ASM and IMEC. 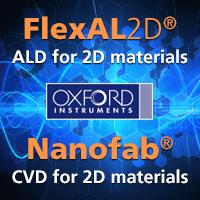 The workshop features leading academic and industry experts in surface chemistry, new processes, metrology, fields of applications and all technology needs and challenges for ASD. 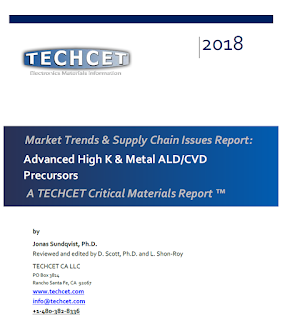 Spiegelman and Alvarez will be available to discuss the company’s ASD product line-up, which includes hydrogen peroxide and hydrazine gas delivery in addition to water vapor. RASIRC RHA enables the delivery of purified water vapor into low pressure processes. 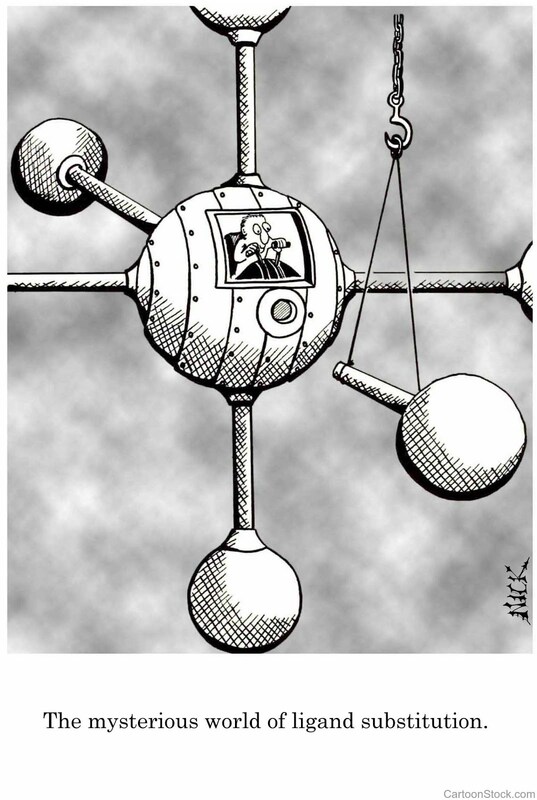 The membrane delivery system separates the liquid water and its headspace from directly seeing the process vacuum. The membrane assembly allows the mass transfer of water vapor at a known diffusion rate for a given set of parameters (temperature, pressure, surface area, carrier gas flow rate). BRUTE® Peroxide is a novel oxidant that improves nucleation density at film interfaces when compared to other oxidants. 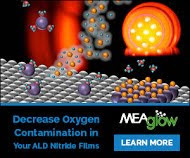 Surface functionalization is more dense and initiation is faster using anhydrous hydrogen peroxide gas compared with alternatives. This can allow for better selectivity and less damage to metal surfaces in ASD processes. BRUTE® Hydrazine enables uniform nitride deposition for Silicon and early transition metals at low temperature. BRUTE® Hydrazine may also be used as an atomic hydrogen source, where metals such as Ru, Cu, and Co may be cleaned and reduced. Hydrazine gas is generated in situ and is virtually water free. Brute Hydrazine has been formulated for a relatively high flash point for safer handling. RASIRC Peroxidizer® provides high volumes of reactive H2O2/H2O mixtures for high throughput ALD. This reactive gas generator is ideal for roll-to-roll ALD coatings that require high speed deposition at reduced temperatures. 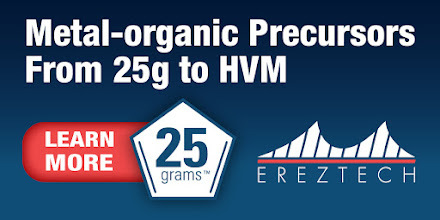 Additional RASIRC products include the RainMaker Humidification System (RHS) and the Hydrogen Peroxide Steamer (HPS). The RHS generates water vapor for oxidation applications and the HPS provides surface cleaning, preconditioning, wet thermal oxidation and residual carbon removal.